To strengthen civic engagement, projects often need to take a holistic approach. But what does that mean in practice? We’d like to share an example from Moldova, where we’re working with diverse actors across the country to support democratic and transparent reforms. In Moldova, there is a deep suspicion that local administrations are not open to listening to citizens and that people’s needs will never be addressed. This discourages many people—especially youth, women, and vulnerable groups—from engaging in democratic processes at the local level. This dynamic is a major impediment to project sustainability. We’ve observed that when projects are not rooted in the needs of the community, there is a high probability they will degrade into burdens on local budgets. Rather than unite communities, such initiatives can lead to deeper apathy and disengagement. In Moldova, we are applying these principles in a five-year, USAID-funded program called Comunitatea Mea (CM). The program aims to connect local public authorities directly to the needs of their citizens by engaging all stakeholders on diverse priorities. Building the skills of local civil servants is essential for transformative change. To support mayors, CM uses innovative tools such as the Functional Organization Capacity Assessment (FOCAS) and Municipal Strategic Planning Workshops (MSPWs) initially developed by TetraTech ARD, an IREX partner on Comunitatea Mea. Using these tools, mayors evaluate the capacity and resources that they need in order to connect with citizens and create effective action plans for improving municipal services. To most effectively allocate and use limited financial resources, CM assists communities in developing medium- and long-term capital investment strategies. Good capital investment strategies lead to better planning, implementation, monitoring, and evaluation processes. They also pave a road for communities to continually improve citizen participation and public engagement at the local level. Finally, they build the capacity of local public authorities to use effective, transparent tools and institutionalize systems of keeping citizens informed about how authorities plan to use resources. Comunitatea Mea approaches citizen participation as a cross-cutting activity. CM incorporates local civic engagement in every stage of the program to achieve greater participation and transparency in public decision-making processes. This is often considered a departure from traditional methodologies. For example, in Moldova some local administrators with a more top-down, Soviet-era style of decision-making remain reluctant to engage their communities directly. From their perspective, engaging with citizens distracts officials from getting the “real work” done. 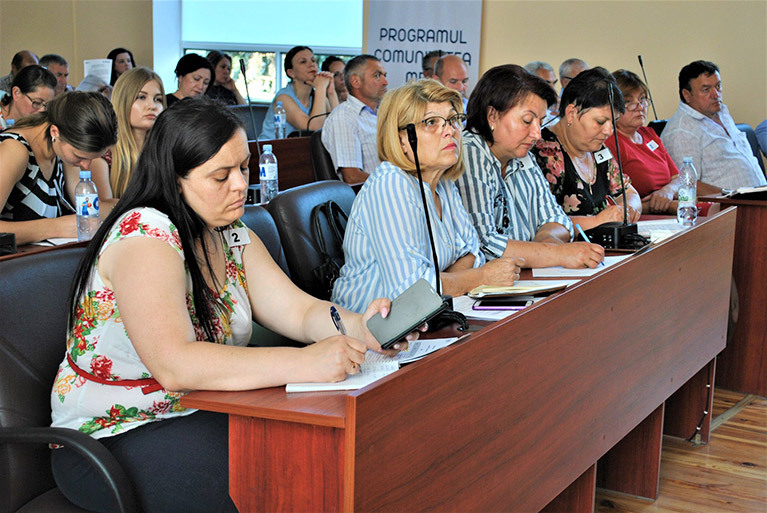 At the same time, there are many communities in Moldova that excel at citizen engagement, where administrators view collaboration with citizens as a step toward creating more committed community members and increasing support for development projects. Citizens who participate in decision-making processes or local development activities are essential to project success. By working with citizens across society, CM increases the likelihood that community voices will be heard and that community projects will succeed. In Moldova, improving infrastructure is a key step in building citizens’ trust in local government. Recognizing this reality, Comunitatea Mea allocates resources for small community infrastructure projects. CM will fund up to 100 communities over the course of five years. These projects will endeavor to raise the quality of community life, improve local services, and demonstrate what transparency looks like. The projects will also support community-based development that fosters constructive dialogue and partnerships between local governments and their citizens. Most importantly, we are proceeding incrementally. For us, that means continually recognizing existing obstacles, identifying pathways and targets, and strengthening capacity of various actors to take advantage of political, administrative, or economic opportunities. In particular, that means paying close attention to what is working (and what isn’t working) in current arrangements, collecting evidence about the costs and benefits of innovations, and building communities of expertise around problem-centered policy efforts. Whenever possible, we’re using data, creating deliberative space for discussion and debate, and supporting collaborative experiments among local public authorities to test pathways for improvement.